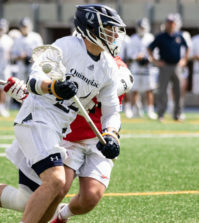 Quinnipiac University doesn’t have a football team, and Director of Athletics Jack McDonald has made it clear it’s very unlikely they’ll ever adopt the sport. Men’s ice hockey and lacrosse are both full contact sports, but nobody has ever registered a tackle the way a defensive lineman sacks a quarterback. New Blue Rugby has tried relentlessly to become recognized by the university, but to no avail. This means Quinnipiac’s first official tackle will be tallied in a women’s rugby game, the only full contact sport for women in existence. When the team plays its first official game – expected to be next spring – it will be just the second women’s rugby team in all of Division I athletics. The only other school to have the sport is Eastern Illinois University, where Becky Carlson played and worked as an assistant coach. McDonald announced last Wednesday that Carlson will coach Quinnipiac’s inaugural women’s rugby squad. Quinnipiac announced this past summer its plans to add women’s golf this year and women’s rugby next year to comply with Title IX. Carlson worked for a marketing firm in Colorado for the past eight months, but has three-and-a-half years of experience as the emerging sports program manager for USA Rugby. At the National Association of College Directors of Athletics 2006 Convention in New Orleans, McDonald and Carlson first spoke to each other over the phone coincidentally in the same Marriott lobby. When the two realized they were in the same room, they looked up and found each other. Carlson’s first client while working at USA Rugby was Quinnipiac. Four years later when Quinnipiac announced its plans to add women’s rugby, McDonald said he had an easy time picking out the team’s first coach. “The first name that came to my mind was Becky Carlson,” McDonald said. 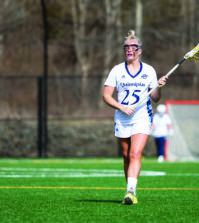 After making the cross-country drive Oct. 22 and getting acclimated to Connecticut, Carlson met 65 Quinnipiac students showing interest in her sport. That number doesn’t include the students she plans to recruit outside of the university. And Carlson will be the first one to admit she had no experience playing rugby before starring for EIU’s rugby team. She also played varsity tennis for EIU. Danielle Slupicki, a sophomore biology major, was one of the students who showed interest in the program, but was discouraged by the major time commitment. “I decided that if I wasn’t going to be able to put 110 percent forward then I didn’t think it would be a good idea,” Slupicki said. 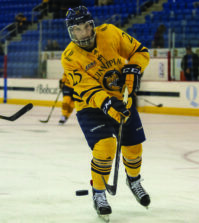 Slupicki’s roommate, Danielle Leahy, remains interested in playing for Quinnipiac. Leahy, a nursing major, played varsity field hockey and lacrosse in high school. Carlson said rugby appeals to a wide range of athletes, but she prefers to recruit basketball players because of their agility. The university can allocate as many as 12 scholarships for rugby, Carlson confirmed. 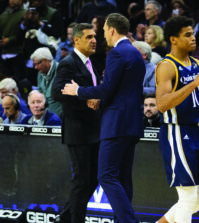 “I’m already getting a massive amount of e-mails, because essentially the advantageous position of which Quinnipiac binds itself in is that Eastern [Illinois University] has had scholarship money, but it’s not a lot,” Carlson said. “We’re pretty much it if you’re looking at scholarship money. Would you watch a women’s rugby match on campus? The NCAA categorizes women’s rugby as an “emerging sport,” which allows the team to play against club teams to help satisfy a varsity schedule. “Norwich, Bowdoin, Southern [Connecticut State], Vermont, West Chester all play varsity rugby,” said McDonald, who is working with Carlson to plan a schedule for the next academic year. McDonald said there will be some form of women’s rugby play this spring. Carlson said she is working with facilities to find a field with adequate dimensions and room for fans near the Quinnipiac Soccer Field. “There’s going to be something this spring; practice, scrimmage, intrasquad – don’t know yet. But that’s what kids want,” McDonald said. As for the possibility of women’s rugby being the first step toward adding men’s rugby as a club sport, McDonald said it would give them a place to play.